This is the final installment of a three-part series covering Marcellus Shale natural gas drilling in Pennsylvania. Read the first part here and the second part here. 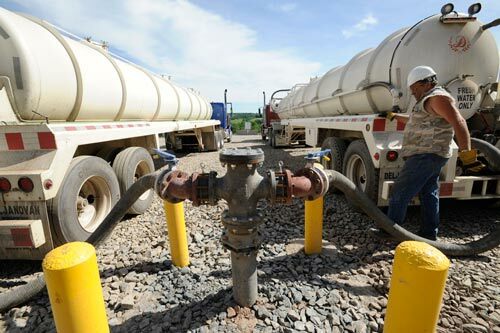 Innovations in drilling technology made accessing the Marcellus Shale financially attractive, but it’s ongoing innovation in other areas of the natural-gas production process that is helping the industry adjust to the differences posed by operating in Pennsylvania. 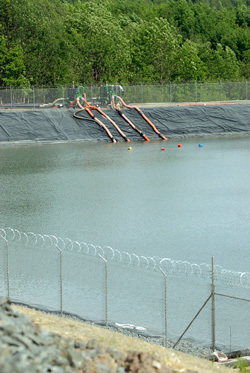 Chief among them is water use, and while the well blowout in Clearfield County and subsequent temporary shutdown of EOG Resources’ drilling has grabbed headlines, a larger water issue is disposal of wastewater. To highlight its concern on the issue, the state Environmental Quality Board proposed last month additional state regulations to limit the amount of “total dissolved solids” in discharges to state waterways. The announcement came after the ecological collapse in Dunkard Creek in southwestern Pennsylvania was traced to high TDS levels, at first incorrectly attributed to gas drilling but later linked to acid-mine drainage and an uncommonly low flow. Integrated Water Technologies is a New Jersey-based company moving into Pennsylvania to develop a process it believes filters water to clean-water standards while creating byproducts that already have resale markets. The company was given approval from the state Department of Environmental Protection to demonstrate their process, and DEP noted in a response letter that the company is working toward approval to build a permanent plant to treat up to 2.5 million gallons a day. Many wastewater treatment operations such as Somerset Regional Water Resources LLC and the Wyoming Valley Sanitary Authority in Luzerne County have announced plans to build plants to provide treatment and recycling services to the industry. The proposed stricter TDS standards specifically target gas drillers, but they likely won’t be an issue for some companies, such as Chesapeake Energy Corp. and Range Resources, who have already integrated treatment and recycling programs into their operations. Chesapeake touts its Aqua Renew initiative to recycle all water used in its operations in the Marcellus. Company officials estimate the program already eliminates the need for more than 4 million gallons of water a month, and its impact is increasing. Because much of the gas drilling is in rural regions, water usage has also had the impact of creating road damage. The water has to be hauled by truck over roads that weren’t designed for large vehicles, and during the spring often turned roads that were already made vulnerable by the freeze-thaw cycle into muddy messes. While drilling companies are paying for repairs, some are considering plans to reduce the problem in the first place. At a hearing before the state House GOP Policy Committee in May, Brian Grove, a director of corporate development for Chesapeake, discussed the company’s strategy to centrally locate water reservoirs between groups of gas-well sites and use temporary surface lines to pump water to the sites without the need for truck hauling. The company is also considering plans to further reduce truck traffic by installing underground water lines that would transport water its source to the impoundments, Grove said. An feasibility study has been commissioned, Grove said. Just as the processes to produce natural gas are evolving, so are plans for its use. Thanks to reduced pollution emissions, coal-fired power plants are being converted to run on natural gas, such as UGI’s Hunlock Creek facility in Luzerne County. Environmental lawyer and advocate Robert F. Kennedy, Jr. has voiced support for coal-to-gas conversions, and gas has also found favor as a compliment to intermittent renewable sources such as solar and wind. 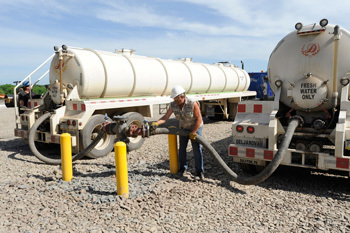 Because gas can be stored and used at any time–a trait known as “dispatchability”–electricity utilities and the federal government are seeing it as a dependable sidekick to pair with renewable sources so companies can meet their state-mandated portfolio standards without fearing a shortage of electricity at times the renewable sources aren’t producing energy. Some companies are already combining the two, and the process may one day find a place in Pennsylvania with a variety of solar projects proving feasible. More likely, though, could be the propagation of natural-gas vehicles. As gasoline prices continue to creep higher and the spill in the Gulf of Mexico remains a constant and nearby reminder of oil’s negative environmental impacts, natural-gas-powered vehicles are gaining an audience. The switch makes economic sense, too: according to the the U.S. Energy Department’s most recent Clean Cities Alternative Fuel Price Report, the national average for a gallon of gasoline is about $1 more than an equivalent amount of compressed natural gas. Pennsylvania has at 26 natural-gas refueling stations, tax breaks exist for purchasing the vehicles, converting from other fuel sources and installing home refueling stations that tap into existing gas lines for home heating. 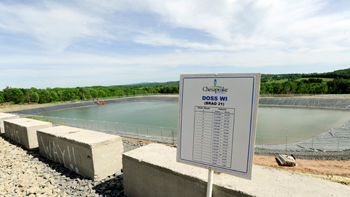 Chesapeake Energy fills its freshwater impounding pond with fresh water from trucks in Bradford County. A series of pipes leads from the pond out to the drill sites.